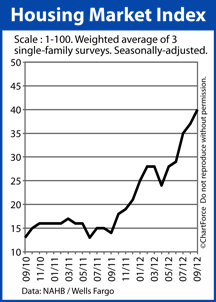 Home builder confidence continues to rise. As reported by the National Association of Home Builders, the Housing Market Index, a measure of builder confidence, rose to a reading of 40 in September — its highest mark since June 2006. For home buyers , the survey may be signaling higher new home prices ahead; when builders are more confident in housing, they’re may be less likely to make concessions in price, and to “sweeten” deals with free upgrades and/or subsidized mortgage rates. There are currently just 142,000 new homes for sale nationwide, the stock of which will “sell out” in 4.6 months at the current pace of sales. In Loudoun County, new home communities like Brambleton and One Loudoun are seeing continued brisk sales. If you’re planning to buy new construction later this year or into early-2013, consider moving up your time frame. Homes may be for sale, but they won’t likely be as inexpensive as they are today.